Greek for "Bearkeeper". The bear is the constellation Ursa Major (the Great Bear). 4th brightest star in the sky. 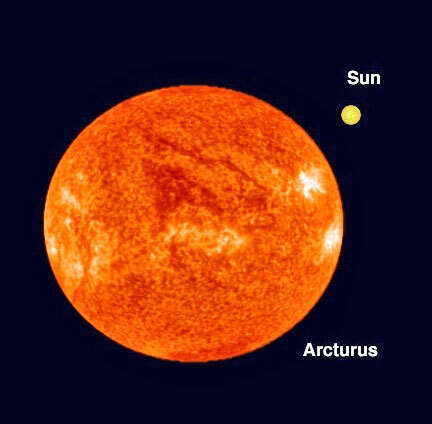 The reddish light of Arcturus striking a photoelectric cell marked the beginning of the 1934 Chicago World's Fair. Orange Giant (K2 III Spectral Class), surface temperature 4400K. Fusing helium to carbon and oxygen in its core. One of the reasons Earth has not been attacked by warlike negative extraterrestrials has been those civilizations' fear of the advanced starships of the Arcturians. Their ships are state-of-the-art technology, far beyond anything I have mentioned so far. One of the starships circling the Earth is called the Starship Athena, after the Greek goddess.